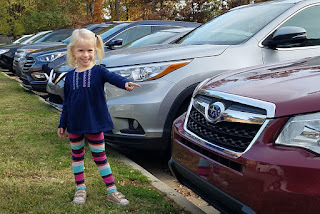 Sweet Pea, doing her favorite thing: identifying the makes of all the cars she sees. She has an insatiable appetite for learning the car symbols and names. For months now, this has been her hobby. She wants to learn more, but we've already learned all the primary brands and most of the secondary. We've moved on to more obscure makes like Bentley, Maserati, etc. She even knows which ones are out of production: "There's a Saturn sedan, Mommy! We don't see those very much because they don't make them anymore." Recently, she's knocked my socks off several times by correctly identifying cars when she can't even see the symbol. "That's a Mercedes sedan," she informed me recently, pointing at a car next to us. "How can you tell?" I asked. She answered: "It just looks like one." Sure enough, as it accelerated ahead of us, I saw the familiar symbol. Her favorites are VW Beetles and, more recently, Minis. But in lieu of one of those in our school parking lot, she said a Subaru was the best.